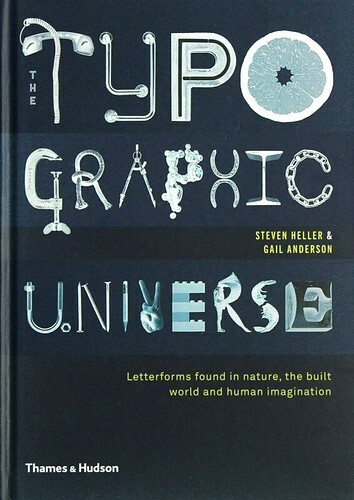 The Typographic Universe: Letterforms found in nature, the built world and human imagination by Steven Heller and Gail Anderson (Thames & Hudson, £24.95) looks at ‘typography styled out of non-traditional sources’ – caterpillar cocoons, ice cubes, shadows, sand, fingernail clippings – made by both designers and non-designers. Some examples are more subtle than others combining appropriate materials with a strong concept, others are aesthetically pleasing examples of natural materials such as cherries, daffodils and jasmine branches that are used to construct perishable letterforms. The final chapter in the book is dedicated to photos of ‘ghost type’ in North American and beyond. Many of the examples included are not one-off experiments in type design, but are ongoing projects, such as Vladimir Končar’s ‘Diary Type’ and Jon Newman’s series ‘Daydreams and Nightschemes’, that continue to develop beyond the confines of the book (which will be released 4 August 2014). Spreads from The Typographic Universe showing Emma Lloyd’s Tameidiau Ohona’i, a piece inspired by David Bell’s 1957 book The Artist in Wales. 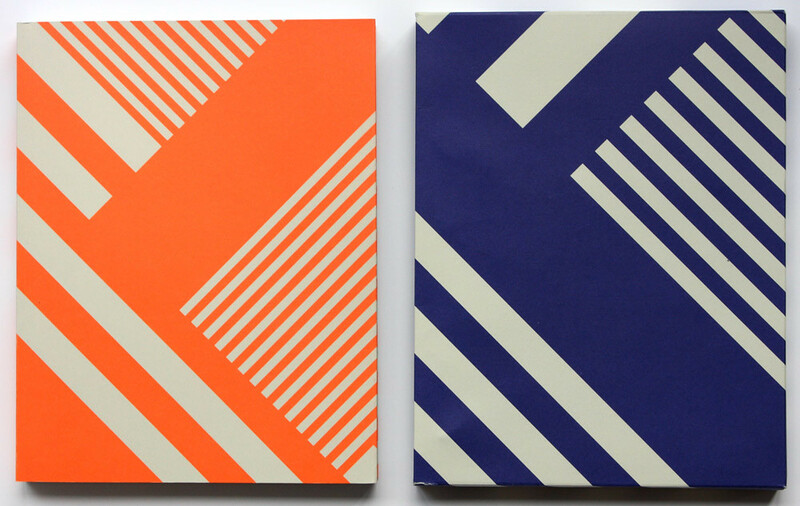 Top: Cover and sleeve for Supernew Supergraphics designed by Tony Brook and Claudia Klat of Spin. Ahonen & Lamberg’s ‘tart card’ designed for Wallpaper* (left) and Vladimir Končar’s fingernail type as part of his ‘Diary Type’ series (right). Cover letters designed by Merlyn Burlanksy, Andrew Byrom, Studio Kalle Mattsson, Dutch Osborne, Erik Varusio and Thijs Verbeek. Book design by Anderson Newton Design. Photographer Matthew Albanese crafts miniature scenes of the Aurora Borealis, wildfires, volcanic eruptions and other natural phenoma. 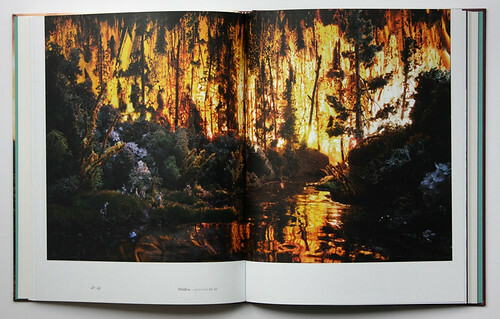 He then turns his camera onto the scenes and, as David Revere McFadden writes in the book’s introductory essay, seduces the viewer ‘into believing in a reality that is entirely false.’ The first half of Strange Worlds (Lazy Dog Press, €39) is dedicated to the photographs; the second half of the book shows his test photographs and more about process of making these imaginative dioramas. 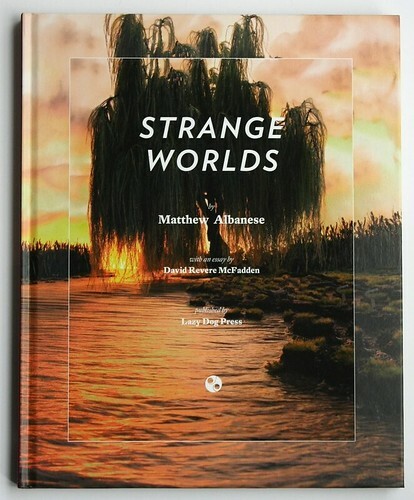 Cover of Matthew Albanese’s Strange Worlds. Design and art direction: Massimo Pitis. Graphic design: Elisabetta Calabritto. 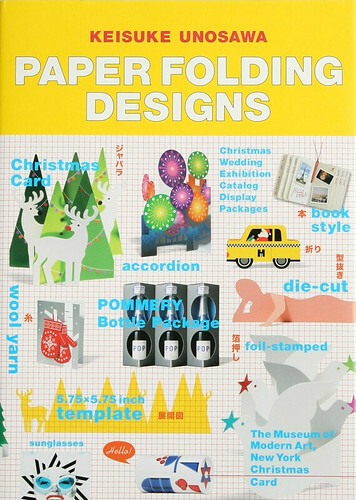 Paper Folding Designs by Keisuke Unosawa (Pie International, £28.50) is a dual language book printed in Japanese and English. The book has a simple format which places a finished folded paper design next to a corresponding pattern for recreating it. Spreads that are dotted throughout the 22 chapters also show several of Unosawa’s more complex designs, some of which were created for the Museum of Modern Art in New York. The book is largely made up of greeting cards, the most exciting of which are for the Christmas season. There are further chapters that include product packaging, stationery and window displays. Paper Folding Design written and designed by Keisuke Unosawa. 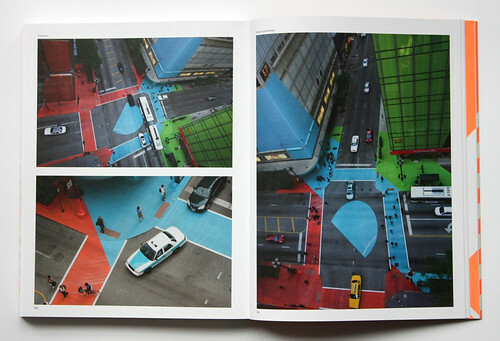 Unit Editions’ Supernew Supergraphics follows their sell-out 2010 title Supergraphics (see ‘Type space’ in Eye 78). 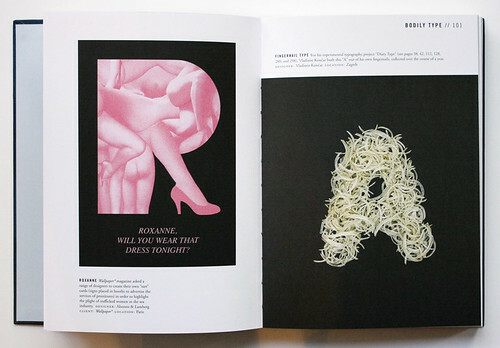 The format of the book throws the reader into a captioned list of illustrations that doubles as a contents page which allows the supergraphics to be shown at their best, spanning across the thick book’s double-page spreads. Steven Heller and Mirko Ilic’s Lettering Large (see ‘Of monumental proportion’ on the Eye blog) and the ‘typographics’ section in Unit Editions’ Supernew Supergraphics draw upon much of the same material. Unit Edition’s image selection brings together a more vibrant collection of pieces and features some smaller and lesser-known projects such as Chat Trevieso’s trilingual Word Play, one of ten Little Free Libraries installed on the lower east side of New York. 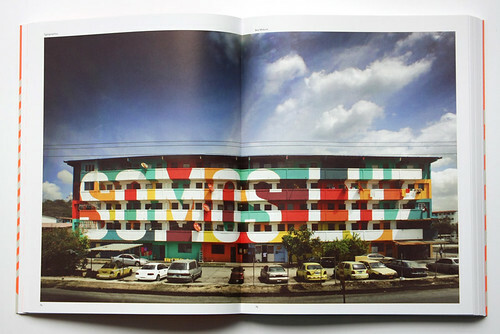 Boa Mistura, Somos Luz (We Are Light), 2013, in Supernew Supergraphics. Jessica Stockholder, Colour Jam, installed in Chicago for the Chicago Loop Alliance, 2012. 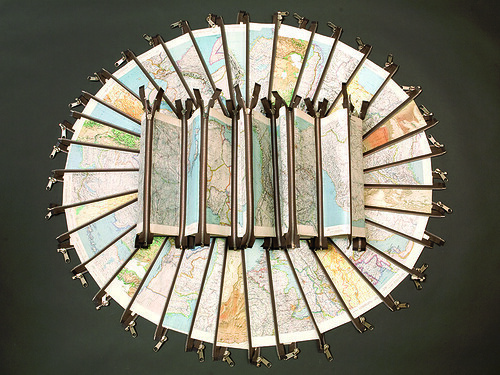 The Open Book Project (Eastern Michigan University Galleries, $35) is edited by Leslie Atzmon and art directed by Atzmon and Ryan Molloy. It includes extensive texts on the subject of book design from people such as Johanna Drucker, Emily McVarish and Tony White. 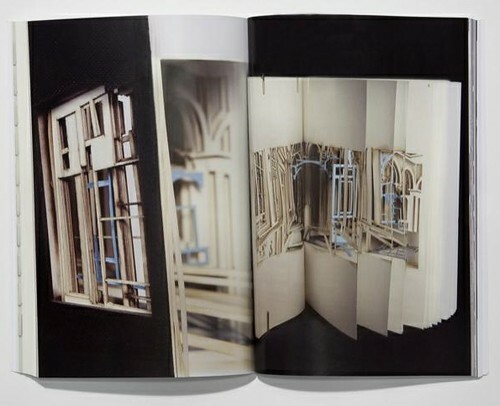 The book also acts as an exhibition catalogue for ‘Open Book’, which was co-curated by the pair in 2010 and reflects an on-going project that includes book design workshops (one is which is presented in the book’s folded dust jacket designed by Bonnie Lobbestael). The Open Book Project considers what constitutes a book, the objectification of the book and ‘curiosity about the interrelationship between digital and physical objects’. It also points to London-based publisher Visual Editions (see ‘Space for stories’ in Eye 87) as a forerunner in commercial publishing who ‘question what books are and can be’. Open Book is beautifully designed using multiple stocks and typefaces (each section designed by a different designer) to differentiate one section from another. There are three purchase options for the cover – laser-cut board, laser-cut acrylic or plain – and within in it there is a complex folded-paper dust jacket that can be cut-up to form a second smaller book. 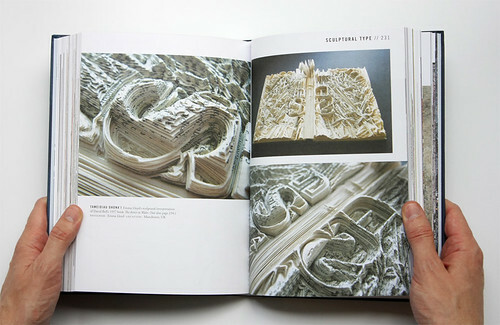 Spread showing photographs of The Winter Palace, a laser cut book by the architect and designer Johan Hybschmann. Doug Beube, Border Crossing: In the War Room. Photograph: Alex Mandrilla. 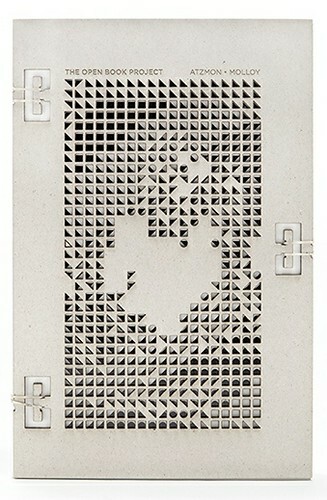 Laser-cut board cover for The Open Book Project, designed by Ryan Molloy.